Project ‘Aurelia 1+Hz / proto viva generator’ addresses the possibilities of coexistence of animals and machines. In contrast to robots, which are driven by digital artificial intelligence, the project uses a live organism to process the “aliveness” of a simple machine. The Aurelia 1+Hz project is divided in two parts; the performance proto viva sonification looks into a new critical redefinition of social values and new attitude towards cohabitation of interspecies while the installation proto viva generator deals with the biopolicy of prolonging life. 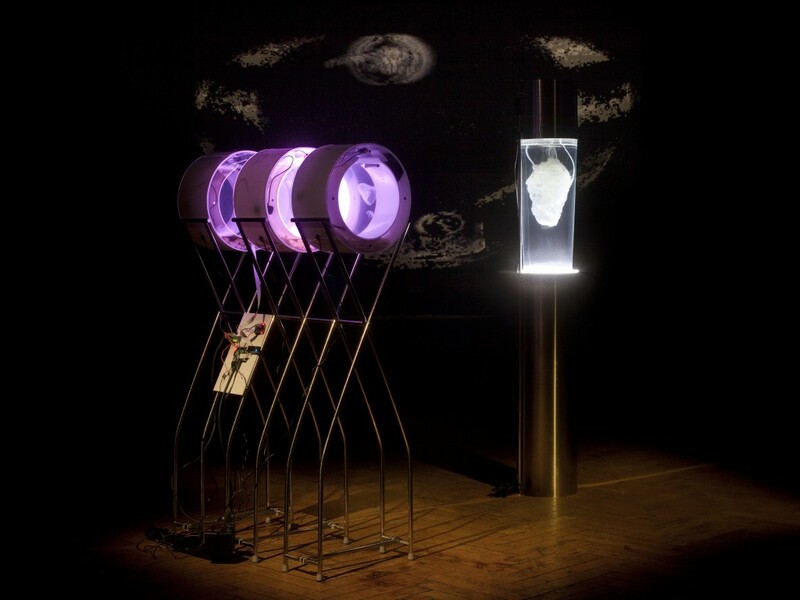 Aurelia 1+Hz/proto viva generator (interactive installation 2014) addresses the possibilities of coexistence of humans, animals and machines. 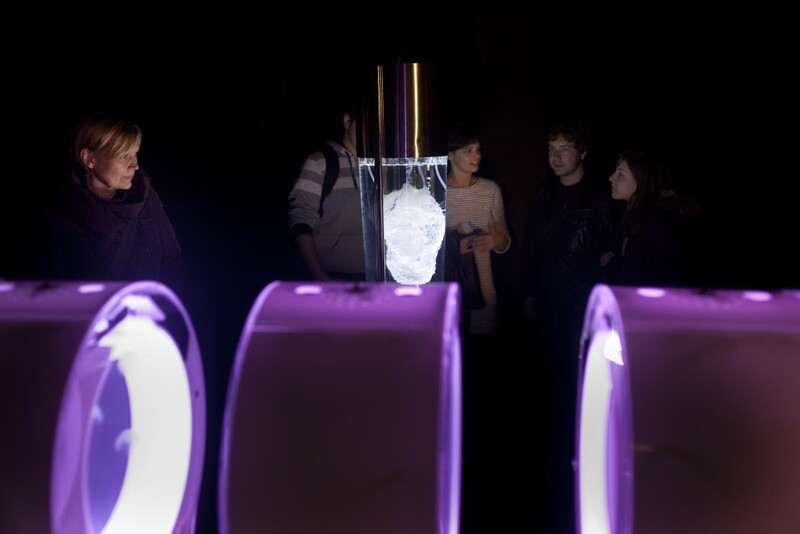 The project uses living organisms to process “aliveness” of a simple robotic machine. 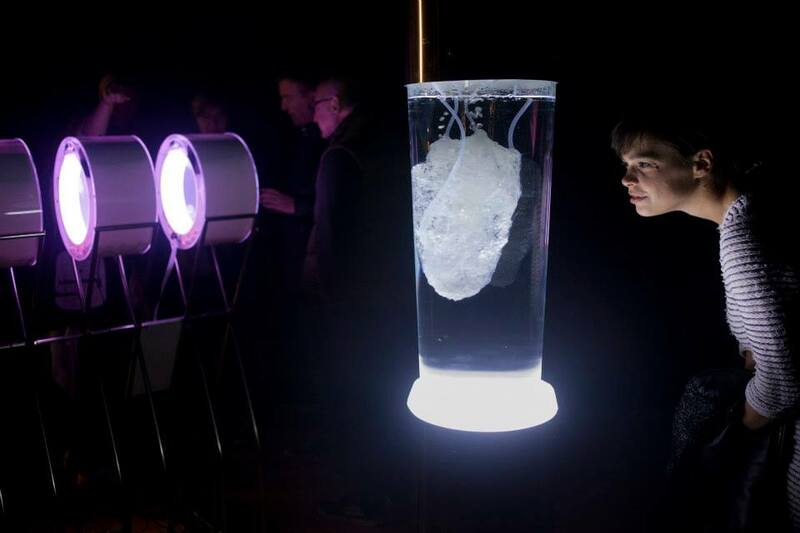 The installation addresses two entities – jellyfish and robot – separated, but if they merged into one, causing new biocybernetic organism to occur: Would “it” be able to live forever? 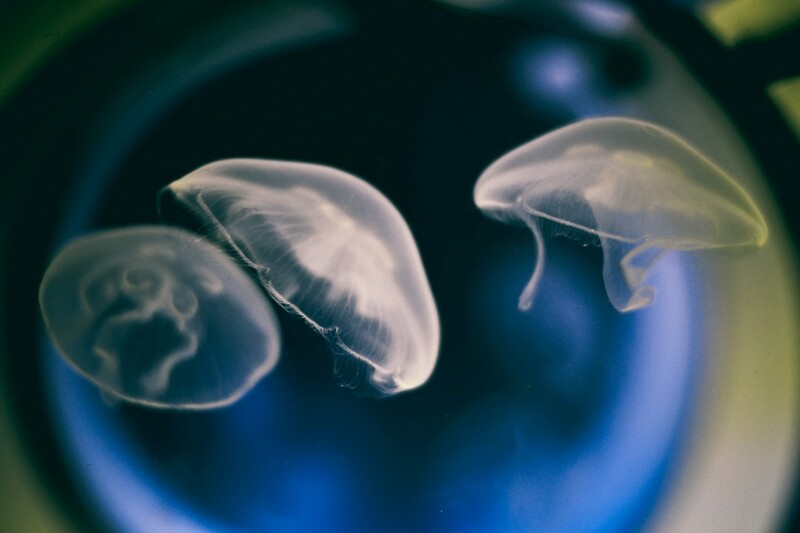 In the era of the Sixth Extinction of species, after pulsating through the world’s seas and oceans for over 500 million years without ever being endangered, the jellyfish are the perfect evolutional archive, showing us potential moves the future might make. The eternity of the jellyfish – some are even immortal as a species – has been fueling even the most ancient human thoughts on eternal life, on the mythical search for the fountain of youth and on immortality. Improved living conditions in a technologically advanced world enable us to lead a significantly longer life than in the past. But how long is long enough? The answer to this question appears to be in the hands of the cosmetic and pharmaceutical industries, which use the powers of biopolitics and capital to divide our society into those who are able to prolong their life, and into those who are merely trying to survive. The historical tactics of civilizations trying to ensure their cultural immortality are today contrasted by the biotechnological possibilities of actually designing and controlling life, demanding a new, critical redefinition of social values. 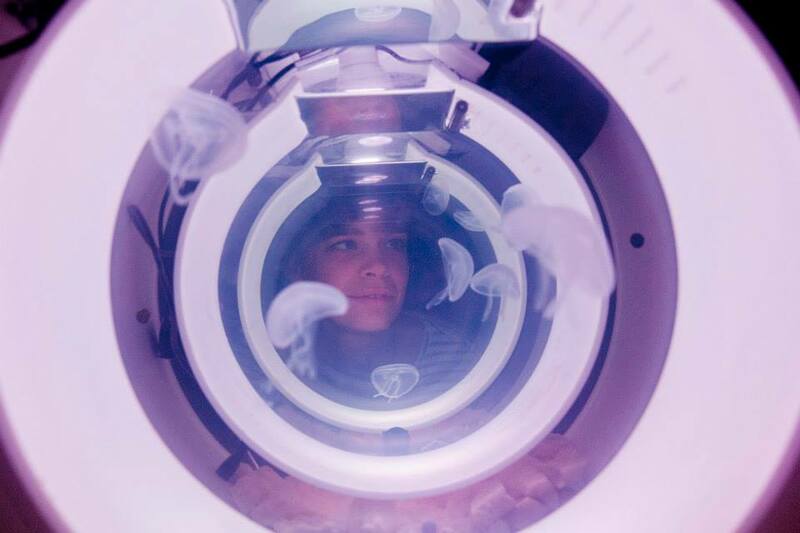 Jellyfish used in frames of the project are from the species of Aurelia Aurita or moon jellyfish. It is the most common jellyfish that is to be found in all seas and oceans and, at the same time, modular organism in the laboratories for jellyfish research. The aquariums that are used in frames of the project are developed by Cubic Aquarium Systems and are built in a way that enables these organisms to have the best possible experience in closed habitat. Aurelia 1+Hz / proto viva generator is an installation that addresses the possibilities of coexistence of humans, animals and machines. 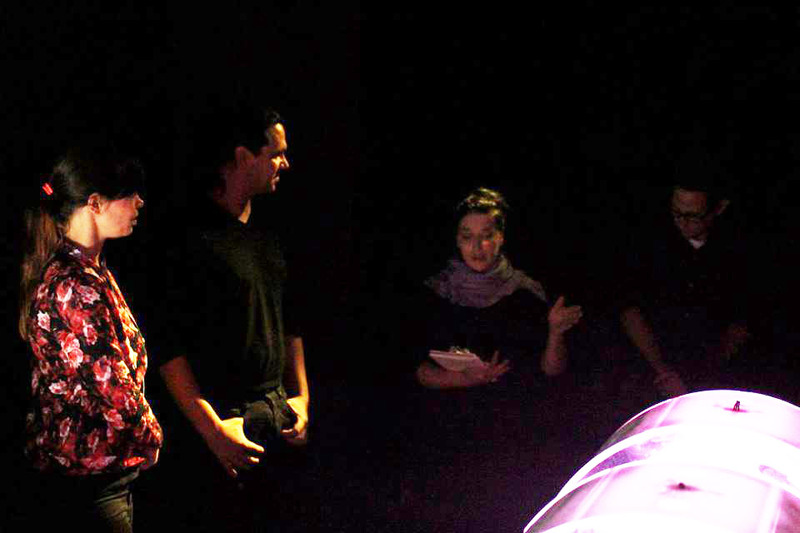 The project uses living organisms to process “aliveness” of a simple robotic machine. The installation addresses two entities – jellyfish and robot – separated, but if they merged into one, causing new biocybernetic organism to occur, would they be able to live eternal life? Mechanical part development_ Scenart, d.o.o. V času šestega izumiranja vrst so meduze, ki pulzirajo v svetovnih morjih in oceanih že preko 650 milijonov let, ne da bi bile pri tem ogrožene, evolucijski arhiv, ki nam pomenljivo nakazuje poteze prihodnosti. V projektu ‘Aurelia 1+Hz’ z zajemanjem in analizo pulziranja množice meduz (uhati klobučnjak) signale pretvarjamo v pulziranje enega mehanskega objekta. Odvisnost stroja od živega organizma postavlja arhetipsko napetost med živim in neživim in s tem poetično primerjavo med enostavno življenjsko obliko, ki poganja – oživlja – kompliciran stroj. Biološke oblike življenja so omejene s preživetvenimi taktikami in z življensko dobo, ki jih biološke, medicinske in inženirske inovacije še niso popolnoma preučile. Dejstvo, da so meduze večne (nekatere kot vrsta, nekatere pa kot posameznice tudi nesmrtne), poganja že staro željo po večnem življenju, mitskemu iskanju vrelca mladosti in nesmrtnosti. Boljši življenski pogoji ljudi, ki živijo v tehnološko razvitem svetu, omogočajo daljše življenje. Toda, kako dolgo je dovolj dolgo? Na tej dilemi raste farmacevtska in industrija kozmetike, vendar pritisk biopolitik deli družbo na tiste, ki si svoje življenje lahko podaljšujejo in tiste, ki skušajo zgolj preživeti. Zgodovinske taktike civilizacije, ki si s pomočjo kulture ustvarja simbolno nesmrtnost, danes kontrastirajo biotehnološke možnosti dejanskega nadzorovanja in oblikovanja živosti. V projektu ‘Aurelia 1+Hz’ v tradiciji taktičnih medijev preverjamo možnosti sobivanja živali in strojev, t.j. ustvarjanja preprostih oblik umetnega življenja, ki v nasprotju z roboti, ki jih poganja digitalna umetna inteligenca, uporabljamo živ organizem za procesiranje živosti preprostega stroja. This entry was tagged acoustic, animals, anthropocene, Aurelia 1+Hz, ecology, eternity, Gallery Kapelica, Gjino Šutić, immortality, jellyfish, jellyfish art, Kapelica, live organism, Living system, Luka Mohorič, Miha Presker, Mojca Jež, ocean, prof. dr. Alenka Malej, regenerative medicine, Robertina Sebjanic, Scientist, sea, Slavko Glamočanin, Stem cell. Bookmark the permalink.